1558. Queen Mary I lost Calais as a result of becoming involved in Philip II’s policy against the French. She died on the 17 November the same year. Her half-sister, Elizabeth, sitting beneath an oak tree at Hatfield became queen. On the borders between England and Scotland, life continued as usual – that is to say raiding and cross-border forays. I might dress it up as Scottish loyalty to their French allies and English obedience to Phillip II’s foreign policy but in reality it had nothing to do with continental Europe. In 1558 on the East March the 7th Earl of Northumberland set out on a cattle raid with the Berwick garrison and was heading for home when the Scots turned up in what can only be described as high dudgeon. There was an English victory of sorts at Swinton. John Knox having done a stint on the French galleys (which perhaps accounts for his hostility to the nation) had sought refuge in Edward VI’s protestant realm before fleeing to Geneva. During the summer of 1558he published The First Blast of the Trumpet Against the Monstrous Regiment of Women. He did not mean that they were deeply unpleasant merely that a reigning queen was an unnatural phenomenon. He was referencing Mary Tudor in England and the regent of Scotland Mary of Guise who ruled on behalf of her daughter Mary Queen of Scots. It was perhaps unfortunate for him that in November the monstrous regiment of Catholic queens was joined by Protestant Elizabeth. I am not going to recount the next decade’s history. Suffice it to say there was the novel sight in 1560 of an English fleet joining with the Protestant Scots against the Catholics and the French besieged in Leith. The following year the recently widowed dowager queen of France, Mary Queen of Scots, arrived back in her homeland at the very same location. Initially guided by her half-brother, James Stewart (Earl of Moray), all went smoothly but then in 1567 having made an ill advised marriage to Lord Darnley swiftly followed by murder at Kirk O Field she lost her throne and on 16 May 1568 found herself seeking sanctuary in Workington. She was to remain in England for the next nineteen years before being executed. Mary’s arrival was not good news so far as her cousin Elizabeth was concerned. Mary spelled trouble. For a start she was Catholic and Mary’s father-in-law, Henri II, had quartered the French arms with those of England on hearing the news that Mary Tudor had died. His logic was very simple. Elizabeth was illegitimate and therefore the next claimant to the English throne was the grand daughter of Margaret Tudor, the eldest daughter of Henry VII of England. Mary did not help matters by refusing to recognise the Treaty of Edinburgh which identified Elizabeth as the rightful queen of England. The treaty, negotiated by Cecil, should have been ratified in July 1560 and it accounted for Mary’s long sea voyage to Scotland rather than a land journey through England. The arrival of Mary in England undoubtedly signposted rebellion and plotting to come – not to mention some light cousinly jealousy. Elizabeth did not know what to do with her cousin and although she moved her south into the custody of the Earl of Shrewsbury it swiftly became clear that she was not as keen to meet Mary as Mary was to meet her. Mary’s trial at York was a device to ensure that Elizabeth should never meet her cousin and that Moray could produce the so-called “Casket Letters” that would keep his half-sister in England. Meanwhile various Catholic nobles (and non-Catholic nobles for that matter) bent their minds to the problem of what to do with Mary. The Percy family were Papists and it is perhaps not surprising that Thomas Percy the 7th Earl of Northumberland was sympathetic to the young Scottish queen’s cause. He even tried to have her turned over into his custody. Unsurprisingly “Simple Tom” pictured at the start of this post was not given her guardianship. He was, however, encouraged in his increasingly illegal actions by his wife Ann. His conspiracy was joined by Charles Neville the Earl of Westmorland. The two earls shared their plans with their wider families and the northern affinity of gentry including Leonard Dacre. The plotters met at Topcliffe and agreed that they wanted Catholicism restored and Elizabeth’s bad advisors to be disposed of – so the usual rubric. They did intend to free Mary Queen of Scots from Tutbury but they claimed that they wished to return her to Scotland rather than unseat Elizabeth. Meanwhile Robert Dudley supported the idea of Mary being returned to Scotland with a new and reliable husband to keep an eye on her. 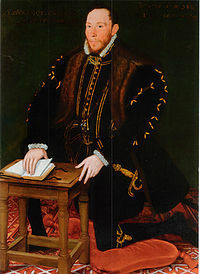 William Maitland of Lethington, Mary’s ambassador had suggested that the Duke of Norfolk was just the chap in 1560 despite the fact that the first Duchess of Norfolk was very much alive at the time. Thomas Howard had been appointed Lieutenant General of the North in 1569 by Elizabeth. She was, if you like, extending the hand of friendship to her Howard cousins who had connived at the downfall of her mother Anne Boleyn and ultimately been associated with Catholicism rather than reform. She was also getting him as far away from court as possible not least because his grandmother was Anne of York one of Edward IV’s daughters making him Plantagenet and a possible claimant to the throne. By now Howard had been widowed twice over and as such was a suitable spouse for the captive queen. He was rather taken with the idea but quite horrified to find himself carted off to the Tower when Dudley confessed to the queen what was planned in terms of an English-Scottish marriage. Inevitably things are not so straight forward and ultimately Norfolk and the Northern Lords would be betrayed by Leonard Dacre who was narked by the fact that Howard who had been married to Elizabeth Leyburne (the widow of the 4th Lord Dacre) had become guardian to the 5th lord and the 5th lord’s three sisters. In 1569 little George Dacre had an accident on a vaulting horse and died. Howard now took the opportunity to marry the Dacre girls off to sons from his previous two marriages and claim that his three daughters-in-law were co-heiresses and that the whole estate was now Howard property. Leonard Dacre was not a happy man. A judgement of Edward IV had entailed the title and estates to male heirs so by rights he should have had the title and the loot. Even worse the case was heard by the Earl Marshal’s court – and yes, the Dukes of Norfolk are hereditary earl marshals of England. Let’s just say Leonard was a man with a grudge and the borderers were rather good at holding grudges for a very long time. He betrayed the northern earls and of course the Duke of Norfolk in the hope that he would see the estates that were rightfully his returned. Dacre would encourage the northern lords in their plan to free Mary and overturn Protestant England but at the same time, when he judged the time was ripe, spill the beans to Elizabeth. Elizabeth would later describe him as a “cankred suttl traitor.” However, I am jumping the gun. Elizabeth ordered Northumberland and Westmorland to London to explain themselves. The two hapless peers panicked and rebelled. On the 10th November 1569 the Earl of Sussex wrote to say that Northumberland had fled from Topcliffe. Three thousand or so men gathered in Durham on the 14th November where a Mass was heard and Protestant texts destroyed. Men set off for Hartlepool where the Duke of Alva was supposed to land troops and to Barnard Castle to besiege troops loyal to Elizabeth. The castle held out for a week before it surrendered. The Earl of Sussex would come under suspicion for not gaining the upper hand quickly enough. From Barnard Castle the plan was to march on York. The earls were declared traitors on the 26th of November and the hunt began. On the West March a plan was now unfurling which would have seen the Bishop of Carlisle murdered and the castle in rebel hands. Lord Scrope, Warden of the West March, who had set out from Carlisle to confront the rebels heard news of the plot and scurried back to the castle correctly judging that Elizabeth’s famous temper would not have been placated by excuses regarding the loss of a key border fortress. Meanwhile the queen’s cousin, some would say brother, Henry Carey Lord Hunsdon, was sent north to deal with the crisis. He had been made the Captain of Berwick the previous year. The Warden of the Middle March Sir John Forster, a notable rogue in his own right, now rode agains the rebels accompanied by the Earl of Northumberland’s younger brother Henry. Together they occupied Newcastle and Alnwick and began to move south. The earls fled in the direction of Hexham together with Lady Anne Percy and about forty or fifty retainers when it became clear that they were out manoeuvred by Forster from the North and Carey from the South. For reasons best known to themselves, despite the fact that Leonard Dacre had not joined the rebellion the fleeing party made for North Castle. Leonard was not pleased to see them as he as no doubt thinking of the Dacre estates and Elizabeth’s goodwill. His brother Edward on the other hand provided assistance to the stricken earls. The party had to escape into Scotland or face Elizabeth’s wrath. With that in mind the Armstrongs of Liddesdale seemed like a good idea at the time. The Debateable Lands of Liddesdale belonged neither to Scotland or England and whilst the Armstrongs were notionally Scottish they were Armstrong more than anything else. The hapless earls fell in to the hands of Black Ormiston and Jock of the Side. Jock was a notorious reiver. At this point the Earl of Moray entered the equation and politely suggested that the Armstrongs hand over their “guests.” He sent a party of Elliots, another family of border hard-men to have a little chat. Elliot explained that he was under pledge to Moray and that he would be sorry to enter a state of feud with Ormiston if the two English earls weren’t booted out of Scotland and back into England within the next twenty-four hours. Somehow the earls’ horses had gone “missing” – which is what you get for stabling them with notorious horse thieves- and Lady Anne, heavily pregnant, was exhausted beyond the point where she could travel with her husband. She was robbed and perhaps worse by Ormiston before she was rescued by a party of Ferniehurst Kerrs (the ancestor of Robert Carr, King James I’s favourite). It says something that Kerr was at feud with the Percys but felt that it was beneath his honour to see Lady Anne suffer at the hands of Ormiston – though having said that he was also a loyal subject of Mary Queen of Scots demonstrating that border history is nothing if not complex in its workings. On Christmas Eve 1569 the Armstrongs managed to separate the two earls and Northumberland found himself in the clutches of Moray’s men. The Earl of Westmorland did attempt a rescue with the few men he had but it was unsuccessful. Percy would be returned to England for a cash payment in June 1572 and executed for treason in York that August. Sussex, having got his act together, along with Sir John Forster and Henry Hunsden set the border alight in the greatest raid that Liddesdale had ever seen. MacDonald Fraser states that Forster took £4000 in loot. Let’s just say that rather a lot of homes were burned and livestock pilfered. Ultimately Dacre who thought he had played a clever game found himself at the end of one of Hunsdon’s cavalry lances but only after the border which had only just settled down after the Earls’ rising was set loose again by the assassination of James Stewart Earl of Moray on January 23 1570. A mighty raid gathered pace as Scots began to cross the border in the name of their queen. Dacre who had not benefitted from tattle taling on the earls now came out in supports of the Scots. He managed to put together a band of 3000 men. Henry Carey was not so foolish as to take this band on without support, especially as Naworth was defended by artillery and there was a large party of Scots en route to Naworth. And had Dacre stayed put then my story might have had another chapter but he was spoiling for a fight and he took on Hunsdon at Gelt Wood. If Dacre had won the skirmish then Carlisle might have been in difficulties but as it was Hunsdon who was a tough man led a cavalry charge against the revolting baron and Dacre fled into Scotland with approximately 2000 more rebels according to Lord Scrope. The majority of them remained in the borders joining with the Scottish Marian party against the lords who held the infant James VI. Dacre left the British Isles and travelled to Flanders where he exhorted anyone who would listen to invade England. The rebellion was over. It just left the mopping up operation. Norfolk was released from the Tower but became involved in the Ridolfi Plot so was executed in 1572. The Earl of Westmorland escaped to Flanders dying in 1601 having eked out his existence living on a pension from Philip II. Dacre died in 1573. For Elizabeth it was the start of a series of plots and rebellions revolving around Mary Queen of Scots. The architecture of any border territory is inevitably studded with fortifications; the largest being the castle. On the Scottish borders there are two other kinds of fortified building dating, in their present form, from the sixteenth century. The best known of these two is the pele or peel tower. These were three or four storey buildings with very thick walls. The ground floor was used for storage whilst the upper floors were for living. Some towers like the one at Clifton near Penrith were really only used during times of crisis. Once James VI of Scotland ascended the throne of England after Elizabeth I’s death and became James I of England (uniting the lion and the unicorn as heraldic supporters) he declared that hence forth the borders would be known as the ‘Middle Shires’ and that all peel towers should be dismantled. Given the number of peel towers still standing on both sides of the border it may reasonably be suggested that not all the border families received that particular memo. Others incorporated the family tower into new builds such as at Hutton in the Forest and Dalemain. The third typical border fortification is the bastle house. A bastle house is a fortified farmhouse. Typically it presents as a two-storey building with very thick walls. The ground floor was a barn for livestock. If it had windows at all they would have been narrow slits for ventilation. At Black Middens the original door was in the gable end. The rather dark and dingy upper floor with its tiny door and narrow window were the living quarters which were accessed, in the early days at least, by a ladder which could be hauled up behind the inhabitants in times of trouble. In later times an external stair case was often added along with more windows and doors. The bastle house at Black Middens near Bellingham also boasts some sturdy looking sockets for bars across the door as additional security. A farmer would have to be relatively wealthy in order to afford one of these stone buildings. The Black Middens bastle house also boasts the remnants of an eighteenth century cottage that appears to have been built on the foundations of an earlier bastle house on the site reflecting that these dwellings evolved over time. The Tarset Valley is home to several bastle houses in varying states of decay and which now feature as part of a walking trail. The houses grouped as they are also hint at mutual support in times of trouble. Black Middens is at the end of a long narrow winding sheep filled road with big views. Its very easy to imagine Kinmont Willie, the Armstrong laird best known for being rescued from Carlisle Castle by one of Sir Walter Scott’s ancestors, arriving on the scene to do a spot of reiving. In addition to stealing sheep, horses, mares and a goat the Scot and his merry band of raiders also killed six people and maimed eleven more on one memorable occasion in 1583. Of course, there’re bastle houses all over the borders and it isn’t always necessary to traipse to the back of beyond to find them. In Haltwhistle for example every second house seems to bear a blue plaque announcing its provenance as a bastle house, though these days they have evolved to something barely recognisable as a fortified dwelling. The impact of the Scottish Wars of Independence and the growth of border reiving culture is also recalled in a ballad called ‘The Fray of Haltwhistle’ – yet another pesky Armstrong comes calling. 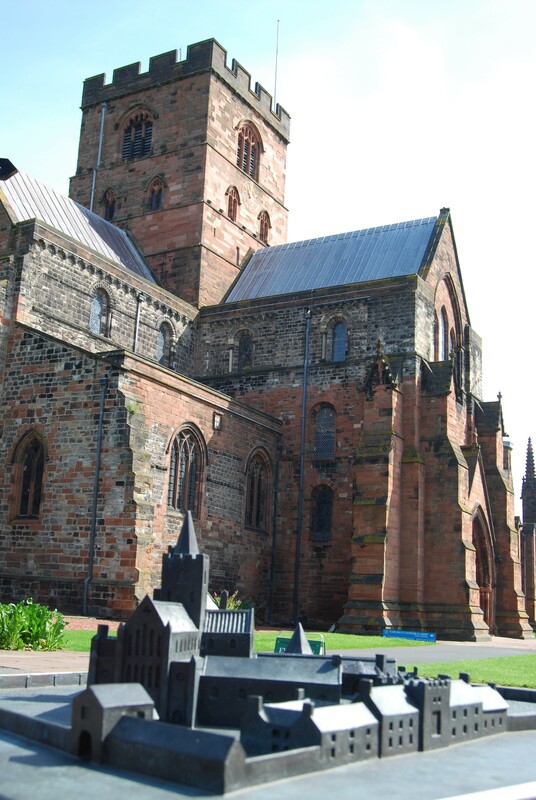 John Maxwell was born in Dumfries the year before the Battle of Flodden. 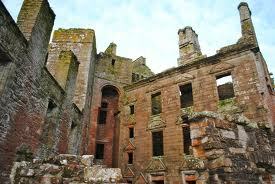 The Maxwells were an important family in the Scottish West Marches – one of their castles was Caerlaverock. Together with the Johnstones they made their mark on the Scottish West Marches – largely based on their hatred of one another. When his father died in 1546, after losing the Battle of Solway Moss and spending some time in English captivity John Maxwell succeeded him as warden of the march- he took his role seriously and later in life made suggestions for reforms that set about ridding the region of lawless Grahams, Armstrongs and other reivers. More immediately however, John needed to make his fortune. He had set his sights on Agnes Herries- it might perhaps have been a love match apart from the small fact that she was an important heiress whose lands marched with his own. Mary Queen of Scots’ regent – the Earl of Arran had also identified the match as a good one for his own son so there was a stand-off as to which man should wed young Agnes. Her opinion was not sought. It was the time of the Rough Wooing, Maxwell was an assured Scot – the English had overrun Dumfries and burned the homes of the lairds who’d refused to sign a paper to say that they would support the English. The assurances came with hostages. It was an established system. Maxwell sent twelve hostages to Carlisle as surety for his good behaviour and he received an English pension in return. The twelve included members of his family. Maxwell was soon faced with a stark choice: he could marry Agnes Herries but he would have to break his assurance with the English. Arran would permit the marriage only if Maxwell agreed. And so John Maxwell became the Fourth Lord Herries. The hostages were executed and according to a local story Maxwell built Repentance Tower as a sign of his repentance for their deaths. More of the tale can be read in my forthcoming book about Harraby Hill – Carlisle’s site of execution. Maxwell was not unduly troubled by the bloodthirsty habits of the times. He and Agnes produced twelve children; he fulfilled his role as Lord Herries and assumed the role of Warden of the Scottish West Marches for several terms of office. Maxwell was also praised by John Knox for his staunch Protestantism. Indeed, the border laird spent time in Edinburgh Castle for his beliefs. It is perhaps strange then Lord Herries, border reiver, Protestant and signatory of the Treaty of Berwick was loyal to Mary Queen of Scots throughout his life. Mary, captured after the disaster at Carberry in 1567 was imprisoned in Lochleven. The English Ambassador, Sir Nicholas Throckmorton identified him as the wisest person in the queen’s faction and also reported that Mary Queen of Scots said ‘there is nobody can be sure of him.’ Certainly he was very critical of her when she refused to be divorced from the Earl of Bothwell – but then James Hepburn was a border baron as well. But then having spoken for the infant King James’ party of Lords on the morning of 13 May 1568 he commanded Mary’s cavalry at the Battle of Langside. Forty-five minutes after the battle began he and his queen were in headlong flight. They rode sixty miles through the night. The queen slept on the ground and cut her hair short to disguise herself. Herries led her through Dumfries to his home at Terregles. Herries wrote to the English Deputy warden, Sir Richard Lowther asking for permission to enter England. The sad little party moved on to Dundrennan Abbey. On 16 May Herries and fifteen loyal followers of the queen accompanied Mary across the Solway Firth to Workington. Herries found himself drawing on old friendships and travelling to London on behalf of his queen who wrote frantic letters to her cousin asking for help in her time of need. It was Herries who helped to represent the queen that October at the Conference of York in an attempt to prove her innocence from any complicity in the murder of Darnley at Kirk o’ Field. By January 1569 it was clear that Mary had thrown herself straight out of the frying pan and into the fire. She was a prisoner. In Scotland, civil war erupted and simmered for a further two years. Unsurprisingly Herries found himself in trouble with the Scottish Regent (and Mary’s half-brother) the Earl of Moray. Once more he found himself in the dungeons of Edinburgh Castle. Although he was released Herries found himself on the receiving end of English raids encouraged by the Scottish government as well as penalties imposed by the Scottish government. Herries was getting old but he made one last attempt to help his queen. He threatened Queen Elizabeth with the suggestion that if she did not support Mary then her friends would have to look abroad for help – a fear that filled Cecil and Walsingham’s minds. Herries continued to play a part in Scottish politics as well as writing his memoirs- he even took on the office of Border Warden on more time under the Regent Morton. He died at the beginning of 1583, four years before his queen. Sir Ralph Eure, a murder and a castle. What more could anyone want – a knight, a murky sort of murder and a Yorkshire castle – Scarborough Castle to be precise. Sir Ralph Eure or Evers came from an old Yorkshire family that had originally arrived with William the Conqueror. His ancestors had been Sheriffs of Yorkshire as well as wardens of the marches. One of them died at the Battle of Towton. Our Sir Ralph’s moment of history came during the reign of Henry VIII. 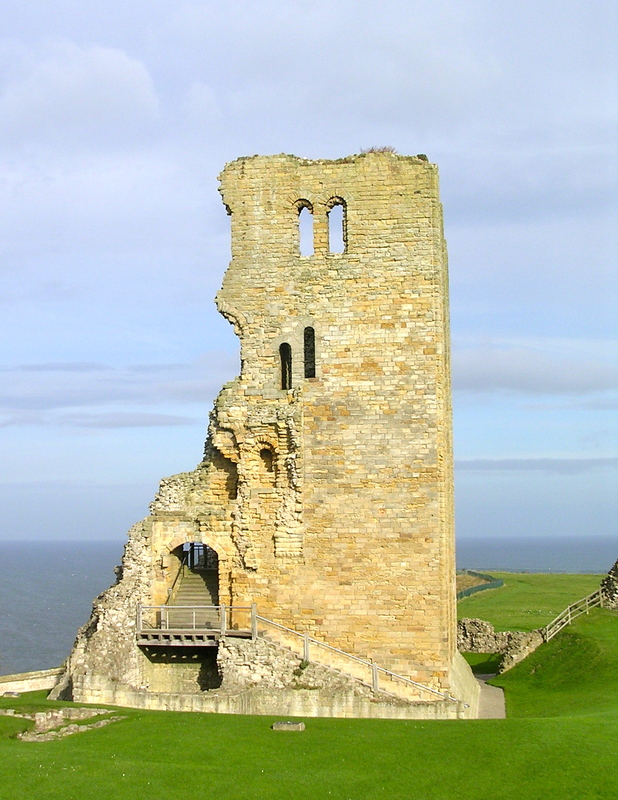 He had temporary charge of Scarborough Castle at the time of the Pilgrimage of Grace. As a result of his loyalty to the king he was made constable of the castle for life. When the castle was besieged in 1536 he kept the gates firmly shut despite the fact that the king had failed to send him supplies for fear that they should fall into rebel hands. Though this appointment was not without a whiff of scandal as Sir Ralph was accused very early in his tenancy of taking the lead off the towers and turrets for his own profit: some of the lead was exchanged for French wine. Despite his inability to read and write Sir Ralph overcame the accusations that he faced and was able to pursue a claim to Sir Francis Bigod’s lands. Sir Francis had been involved in the second part of the Pilgrimage of Grace which occurred against Robert Aske’s advice in January 1537 and which gave Henry the excuse he needed to execute all the leaders of the pilgrimage including Robert Aske. Sir Francis paid with his life and Sir Ralph benefitted in April 1538 when was he appointed chief steward of Sir Francis Bigod’s lands in Lincolnshire and Yorkshire. All straight forward so far. Sir Ralph was on the winning side while Sir Francis gambled and lost. Except, of course, there was more than the Pilgrimage of Grace between Sir Francis and Sir Ralph. The year before the uprising a man named Davy Seignory was murdered by a group of 10 men from Settrington took place in Malton. Seignory was Eure’s servant. The murderers rode to Scotland where they were safe but returned to England sometime later. However, they remained outside the reach of the law because they stayed in the Bishopric of Durham – at this time the whole county was effectively a sanctuary. Cromwell, apparently, tried to persuade Bigod that although the king could do nothing about this unfortunate situation that Bigod could and indeed should take matters into his own hands. Bigod said that sanctuary was more important than the murder and that was that…well apart from the fact that one of the murderers was related to Thomas Cromwell and also the fact that Bigod was in debt at a time and was in effect Cromwell’s man. Let’s just say that the paperwork necessary to bring the murderers before the court in York was incorrectly completed. Strangest of all, Sir Francis Bigod had written a treatise recommending the reform of the monastic system – he was a Protestant, a reformer and Cromwell’s man. Yet somehow he ended up taking the side of the Pilgrims. A fact which enabled Sir Ralph to exact revenge, it would appear, for Sir Francis’s part the shadowy events surrounding his servant’s death. A national event but also a question of neighbours vying for power and perhaps – and this is entirely supposition- a matter of personal dislike. Sir Francis’s version of events and his letters can still be read in the National Archives while Sir Ralph did not have the skills to save his thoughts for posterity. Sir Ralph’s lack of literacy didn’t stop him from becoming in 1542, on the Duke of Suffolk’s appointment, keeper of Redesdale and Tynedale. He took part in many raids and was part of the Earl of Hertford’s ‘Rough Wooing’ in 1544. His actions during this campaign won him the hatred of the Scots. In addition to the usual pillaging of the border he managed to distinguish himself by burning Brumehous Tower- not unusual – but on this occasion the lady and her children were still inside. 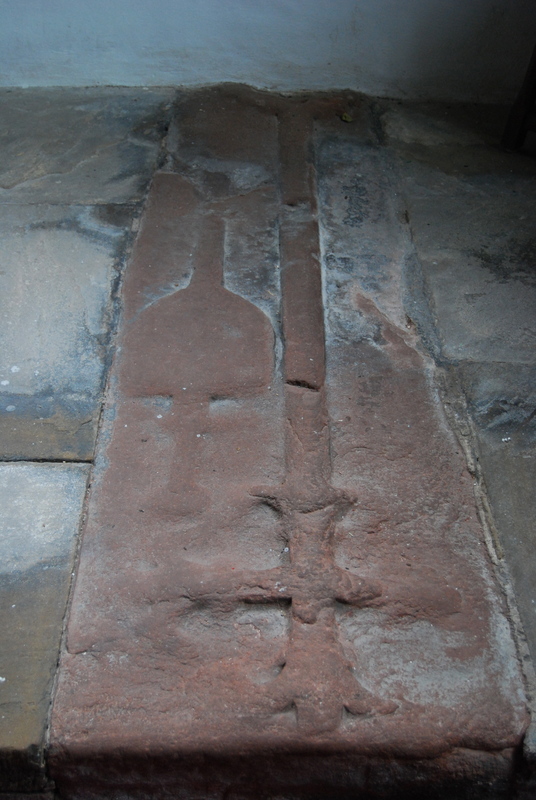 At Kirkby Stephen I am hard on the trail of Sir Andrew de Harcla, First Earl of Carlisle – hero and traitor. I’ve posted elsewhere about his treaty with Robert Bruce that left Edward II so enraged that he had Sir Andrew arrested, stripped of his titles and sent to a traitor’s death on Harraby Hill in 1325 despite the fact that Edward owed his crown to Sir Andrew. Various bits of Sir Andrew’s anatomy were nailed to various city gates but eventually his sister was allowed to gather his remains together and bury him near his childhood home- Hartley Castle- which is just down the road from Kirkby Stephen. Hartley Castle lies beneath the Eighteenth/Nineteenth Century house that stands on the castle’s outer court. On Sir Andrew’s death all his property was forfeit to the crown. It passed from Harcla or Hartley hands into those of Ralph Neville of Raby. He sold it on to Thomas de Musgrave. The stones from Hartley Castle were used by the Musgraves to build a manor house at Edenhall. There are two memorials to the Musgraves in Kirkby Stephen Church and until I read the notes in the church I assumed the knightly effigy in the Hartley Chapel belonged to Sir Andrew. It turns out that the knightly chap is Sir Richard de Musgrave- a good century later than the earl (note to self revisit medieval costume)- while the humble red sandstone slab next to the altar belongs to Sir Andrew. It makes sense because this is, after all, the position with most honour attached to it. The church really is well worth a visit. The Norman church stands on the site of an earlier Saxon church. This in itself sums up Kirkby Stephen. It’s knee-deep in history going back to the Stone Age and Bronze Age. But back to the church. You enter the church precincts through a cloistered area built in 1810. Once inside the church, known as ‘the Cathedral of the Dales,’ as well as the mellow smell of wax and polish there’s plenty of evidence of generations of worshippers. There’re eighteenth century shelves for bread to be given as alms to the poor. And a Loki stone. There are only two Loki stones in the whole of Europe and one of them is in Kirkby Stephen. Loki was the Norse god of mischief. The other Norse gods chained him up because he was a very naughty god…or words to that effect. 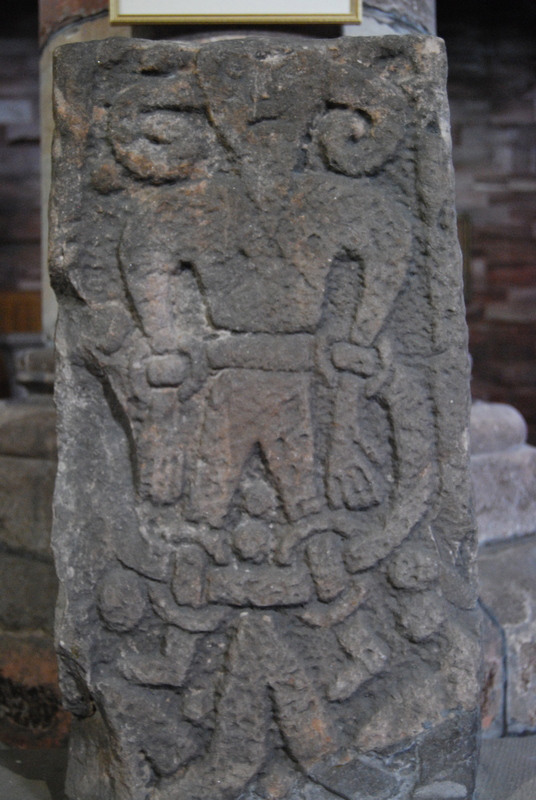 Kirkby Stephen’s Loki stone has been Christianised as he comes from the shaft of a tenth century Anglo-Danish cross shaft. Loki has been transformed into the devil in chains. After all that excitement it was time to brave the rain once again and go in search of tea and scones – all of which, I think you will find, are essential to most acts of historical research. The sun had come out by the time we’d had a nice cup of tea and I was able to explore the town. It was once on the borders and the inhabitants built it so that the streets were deliberately narrow. They’ve been widened but it is easy to see how the people of Kirkby Stephen set about protecting themselves from the Scots. There was also a fascinating leaflet in the tourist information office about Kirkby Stephen’s secret tunnels. One of the suggestions made is that there is a tunnel leading to Hartley Castle as part of the defences against the aforementioned Scots- having said that the leaflet also suggests tax avoidance, plague tombs and links with Pendragon Castle which is just down the road. And yes, Pendragon Castle does have links with King Arthur. He gets everywhere. On a more historically viable basis I discovered that Kirkby Stephen was heavily involved in the Pilgrimage of Grace in 1536/7 which was the North’s response to Henry VIII’s dissolution of the monasteries. James I managed to irritate the citizens of the town when he tried to confiscate some of their land and perhaps unsurprisingly in the light of the previous two facts the town supported Parliament during the English Civil War. They even managed to get themselves involved with a plot against Charles II in 1663. The Kaber Rigg Plot failed and its leaders were hung in Appleby. Who would have thought that such a tranquil little place could have so much fascinating history? The name means ‘gap in the wall’ and the wall is Hadrian’s Wall. Edward I stayed on the site in 1306 but he didn’t actually stay in this castle although he may well have paused to admire the wall that the Romans built. John Thirlwall began building his castle in 1330 on a rocky outcrop next to the Tipalt Burn with the handily placed dressed stone that some one had conveniently left laying around. It was just as well he did. The Scottish Wars of Independence were ongoing but battles were turning into raids. The riding times of the border reivers had begun. Having a good stout stone wall along with a thick oak door protected by an iron yett were handy things to have and as a consequence the Thirlwalls did well. When Lancelot or Lionel Thirlwell died in 1582 he left his widow and eight children comfortably off. Of course, after the Union of the Crowns in 1603 there was less need to live in a cold and isolated castle and by the 1660s the Thirlwalls had taken themselves off to Hexham. Not that this stopped the Scottish Parliamentarian army sleighting it during the 1640s. All that remains today is a ruin and a legend. According to the story there was a rather alarming raid in the offing and the Thirlwall’s needed to hide their possession from the thieving Scots. They happened to have a particularly fine jewel-laden gold table (don’t we all) which a servant hid down a well where it remains hidden to this day. Depending on which version of the story you read, the servants still there as well!